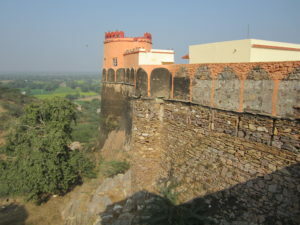 The first really cool place the tour stayed was in a small village with a fort converted to a hotel (Madhoghar Fort)! 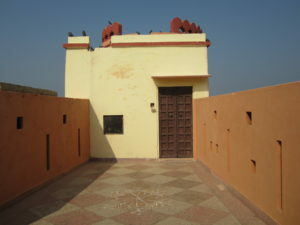 Our room was in a corner of the fort and pretty nice. Some of the other tour members had super fancy bedrooms with tile mosaics and living rooms but we tried not to be too envious. Across from us was a mysterious room with no lock on the door which was slightly ajar. Of course we couldn’t contain our curiosity and wandered in. It was a guest room under construction / in disuse. The bath tub was full of dust and broken boards, there was no furniture and in what should have been the bedroom was a Hindu shrine. Seems like it had been used lately since there were ashes and soot and an idol. Almost every home in India has a Hindu shrine. Incense, flowers, marigolds… often the idol is painted orange with so many coats of paint that the shape is no longer recognizable. That evening we had a really fancy supper. 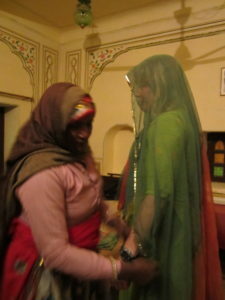 The ladies got whisked away to a private room to get dressed by a local village lady into fancy clothes. After a few tries to get my buxom frame into a top we had success. Then we were paraded downstairs to the courtyard where a fire was burning and the men sadly had only poorly wrapped turbans as their costume (with their regular clothes of course … not JUST the turban). Some of the ladies had to change immediately due to their arms getting the circulation cut off. I think maybe they need to invest in bigger sizes. I was told by some Brits that I have “northern arms” meaning I’m big and strong! Lol that’s a nice euphemism for “fat”. That night we had some Pims brought by The Brit David whose suitcase was like a clown car. He had loads of magical things like gin and Pims and wine. 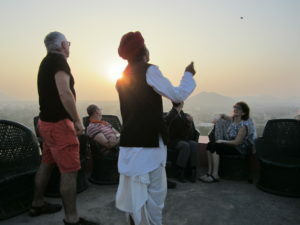 … we were on the rooftop drinking and looking at the fabulous view when we noticed a bunch of kites flying close to us. It was a challenge! Some kids on other rooftops were wanting some fun. We heard peals of laughter. So one of the employees brought out a typical Indian kite which is not much more than two pieces of wood, some plastic that looks like outside wrapping for cereal boxes and some nylon string. They were experts and David was giving it a good British try, but Team Intrepid wasn’t doing so well. 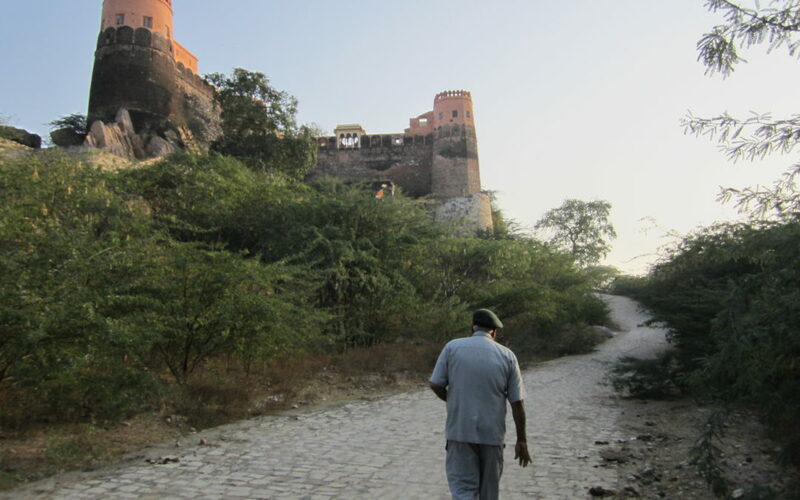 That is, until one of the fort employees in his full fancy Rajasthani garb, took over and kicked those little brats’ asses! Snapped their kite string and everything. Who’s the king of the castle!? The next day we took a walk around the village as a group, which seemed a little like Disneyland but of the serfdom not the castle. I refrained from taking photos because the whole thing felt strangely staged and I felt like I was invading the villager’s space. I felt a little more comfortable when we decided to buy some bracelets from a nice family who were making them right on the spot! There were some kids hanging around and I stole their bike and took it for a spin. When I came back they were all like “WOW you can ride a bike, white lady!” I guess girls don’t ride bikes in India? 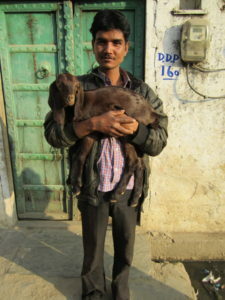 This guy really wanted me to take his photo with this goat. In the morning, the shower was sad and cold so I took a bucket bath. The first of many.